August 12th, Las Vegas---As a worldwide renowned manufacturer and supplier of VoIP solutions and products, Hangzhou Synway Information Engineering Co.,Ltd. attended the ITEXPO2014 in Las Vegas with its latest released portfolios of SS7-enabled gateway and many other outstanding telecommunication solutions. Based on decades of expertise in voice technology, the VoIP gateway is designed especially for telecom operators, system integrators as well as enterprises to move VoIP applications effortlessly and economically. Featuring Telco architecture, the VoIP gateway has been widely applied for stringent and highly demanding VoIP systems for finance, insurance, manufacturing, logistics transportation etc. Categorized into Analog Access Gateway and Digital Gateway, it helps legacy telephone, fax machine and PBXs interconnect with IP network in a simple and economical way. More specifically, SMG1000 analog gateway enables call center and multi-branch enterprises to possess powerful, versatile and efficient VoIP solutions with unparalleled cost advantages. Providing low-to-high scalability(32-512 IP Chs) in a compact 1U chassis, the SMG2000/3000 can deliver SIP services into SS7, ISDN PRI,and SIP networks efficiently and interoperably. Years of professional signaling and voice technology also makes it more reliable and stable for large capacity call centers(IBD/OBD) and multiple branches and can be seamlessly interconnected under extreme network environment. The three-day exhibition served as an effective platform in exchanging opinions, absorbing latest concepts, and also a grand opportunity for Synway to get what customers want in the most efficient way. Attending this summit shows the resolution Synway holds that to be deeply involved in the internationalized standard, and with its more interoperable and flexible VoIP products that conform to SS7, customers will surely benefit more in choosing Synway products. Synway is a leading global communication solutions provider. Through our dedication to customer-centric innovation, we have established end-to-end advantages in telecom networks. 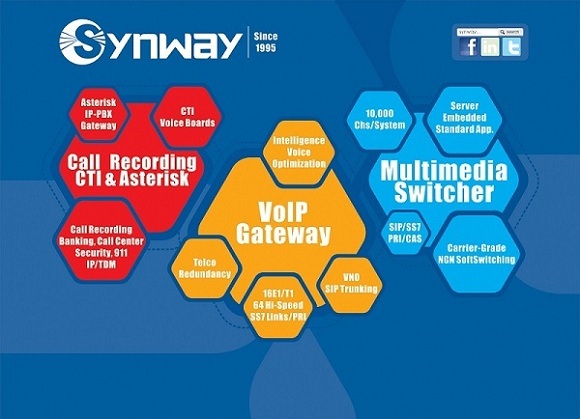 For two decades, Synway has been specialized in providing superior Multimedia Gateway, Integrated Multimedia Switch, Telephony Hardware in use for Telecom communications. With products and solutions deployed in over 140 countries, we are committed to creating maximum value for consumers by providing competitive services. ITEXPO is the World’s leading Communications and Technology Conference where enterprises, service providers, resellers, manufacturers, and developers forge partnerships, build relationships, and close business deals.